The gas industry of the future could manufacture and deliver renewable fuels, rather than mining and processing natural gas. The world can limit global warming to 1.5℃ and move to 100% renewable energy while still preserving a role for the gas industry, and without relying on technological fixes such as carbon capture and storage, according to our new analysis. The One Earth Climate Model – a collaboration between researchers at the University of Technology Sydney, the German Aerospace Center and the University of Melbourne, and financed by the Leonardo DiCaprio Foundation – sets out how the global energy supply can move to 100% renewable energy by 2050, while creating jobs along the way. It also envisions how the gas industry can fulfil its role as a “transition fuel” in the energy transition without its infrastructure becoming obsolete once natural gas is phased out. the phase-out of all fossil fuels, and the conversion of the gas industry to synthetic fuels and hydrogen over the coming decades. Our model also explains how to deliver the “negative emissions” necessary to stay within the world’s carbon budget, without relying on unproven technology such as carbon capture and storage. If the renewable energy transition is accompanied by a worldwide moratorium on deforestation and a major land restoration effort, we can remove the equiavalent of 159 billion tonnes of carbon dioxide from the atmosphere (2015-2100). We compiled our scenario by combining various computer models. We used three climate models to calculate the impacts of specific greenhouse gas emission pathways. We then used another model to analyse the potential contributions of solar and wind energy – including factoring in the space constraints for their installation. We also used a long-term energy model to calculate future energy demand, broken down by sector (power, heat, industry, transport) for 10 world regions in five-year steps. We then further divided these 10 world regions into 72 subregions, and simulated their electricity systems on an hourly basis. This allowed us to determine the precise requirements in terms of grid infrastructure and energy demand. Interactions between the models used for the One Earth Model. Unlike many other 1.5℃ and/or 100% renewable energy scenarios, our analysis deliberately integrates the existing infrastructure of the global gas industry, rather than requiring that these expensive investments be phased out in a relatively short time. Natural gas will be increasingly replaced by hydrogen and/or renewable methane produced by solar power and wind turbines. While most scenarios rely on batteries and pumped hydro as main storage technologies, these renewable forms of gas can also play a significant role in the energy mix. In our scenario, the conversion of gas infrastructure from natural gas to hydrogen and synthetic fuels will start slowly between 2020 and 2030, with the conversion of power plants with annual capacities of around 2 gigawatts. However, after 2030, this transition will accelerate significantly, with the conversion of a total of 197GW gas power plants and gas co-generation facilities each year. Along the way the gas industry will have to redefine its business model from a supply-driven mining industry, to a synthetic gas or hydrogen fuel production industry that provides renewable fuels for the electricity, industry and transport sectors. In the electricity sector, these fuels can be used to help smooth out supply and demand in networks with significant amounts of variable renewable generation. The implementation of the 1.5℃ scenario will have a significant impact on the global fossil fuel industry. While this may seem to be stating the obvious, there has so far been little rational and open debate about how to make an orderly withdrawal from the coal, oil, and gas extraction industries. Instead, the political debate has been focused on prices and security of supply. Yet limiting climate change is only possible when fossil fuels are phased out. Under our scenario, gas production will only decrease by 0.2% per year until 2025, and thereafter by an average of 4% a year until 2040. This represents a rather slow phase-out, and will allow the gas industry to transfer gradually to hydrogen. Our scenario will generate more energy-sector jobs in the world as a whole. By 2050 there would be 46.3 million jobs in the global energy sector – 16.4 million more than under existing forecasts. Our analysis also investigated the specific occupations that will be required for a renewables-based energy industry. The global number of jobs would increase across all of these occupations between 2015 and 2025, with the exception of metal trades which would decline by 2%, as shown below. Division of occupations between fossil fuel and renewable energy industries in 2015 and 2025. However, these results are not uniform across regions. China and India, for example, will both experience a reduction in the number of jobs for managers and clerical and administrative workers between 2015 and 2025. Our analysis shows how the various technical and economic barriers to implementing the Paris Agreement can be overcome. The remaining hurdles are purely political. Over the past 40 years (but in reality since I was five years old), I’ve been fascinated with insects and their ability to sting and cause pain. In graduate school, I became interested in why they sting and why stings from such tiny animals hurt so much. To answer these questions, we first needed a way to measure pain – so, I invented the insect pain scale. The scale is based on a thousand or so personal stings from over 80 insect groups, plus ratings by various colleagues. Insects sting to improve their lives and increase their opportunities. The stings provide protection, thereby opening doors to more food resources, expanded territories, and social life within colonies. By studying stinging insects, we gain insight into our own lives and the societies we live in. To say that insects sting “because they can” isn’t all that helpful. The real question is why insects evolved a stinger in the first place. Obviously, it had some value, otherwise it would have never evolved – or, if initially present, it would have been lost through natural selection. Stingers have two major uses: to get food and to avoid becoming food for some other animal. Examples of the stinger used for sustenance include parasitic wasps that sting and paralyse caterpillars that become food for the wasp young, and bulldog ants that sting difficult prey insects to subdue them. More importantly, the stinger is a major breakthrough in defence against large predators. Imagine, for a moment, that you’re an average-sized insect being attacked by a predator a million times larger than you. What chance would you have? Honeybees face this problem with honey-loving bears. Biting, scratching or kicking won’t work. But a stinger with painful venom often does. In this sense, the stinging insect has found a way to overcome its small size. The stinger is an “insect gun” of sorts – it neutralises the size difference between assailant and victim. This is where the insect sting pain index comes in. Unless we have numbers to compare and analyse, sting observations are just anecdotes and stories. With numbers, we can compare the effectiveness of one stinging insect’s painful defence against others and test hypotheses. One hypothesis is that painful stings provide a way for small insects to defend themselves and their young against large mammalian, bird, reptile or amphibian predators. The greater the pain, the better the defence. Greater defence allows insects to form groups and become complex societies as we see in ants and social wasps and bees. The greater the pain, the larger the society can become. And larger societies have advantages not enjoyed by solitary individuals or smaller societies. Human sociality allows individuals to specialise and do a particular task better than most others. Examples of human specialists include plumbers, chefs, doctors, farmers, teachers, lawyers, soldiers, rugby players and even politicians (a profession sometimes viewed dubiously, but required for society to function). Social insect societies also have specialists. They forage for food, tend to young, defend the colony, reproduce and even serve as undertakers removing the dead. Another advantage of societies is the ability to recruit others to exploit a large food source, or for the common defence, or to have additional helpers for difficult tasks. Sociality also has a more subtle advantage: it reduces conflict between individuals within a species. Individuals not living in social groups tend to fight when they come in contact. But to live in a group, conflict must be reduced. In many social animals, conflict is reduced by establishing a pecking order. Often, if the dominant individual in the pecking order is removed, violent battles erupt. In human societies, conflict is also reduced via pecking order, but more importantly through laws, police to enforce laws, and gossip and societal teachings to instil co-operative behaviour. In insect societies, conflict is reduced by establishing pecking orders and pheromones, chemical odours that identify individuals and their place in society. Why do we love pain? The insect sting pain index also provides a window into human psychology and emotion. Put simply: humans are fascinated by stinging insects. We delight in telling stories of being stung, harrowing near-misses, or even our fear of stinging insects. Why? Because we have a genetically innate fear of animals that attack us, be they leopards, bears, snakes, spiders or stinging insects. People lacking such fear stand a greater chance of being eaten or dying of envenomation and not passing on their genetic lineage than those who are more fearful. Stinging insects cause us fear because they produce pain. And pain is our body’s way of telling us that bodily damage is occurring, has occurred, or is about to occur. Damage is bad and harms our lives and ability to reproduce. In other words, our emotional fear and infatuation with painful stinging insects enhances our long-term survival. Yet, we have little emotional fear of cigarettes or sugary, fatty foods, both of which kill many more people than painfully stinging insects. Fear of those killers is not in our genes. 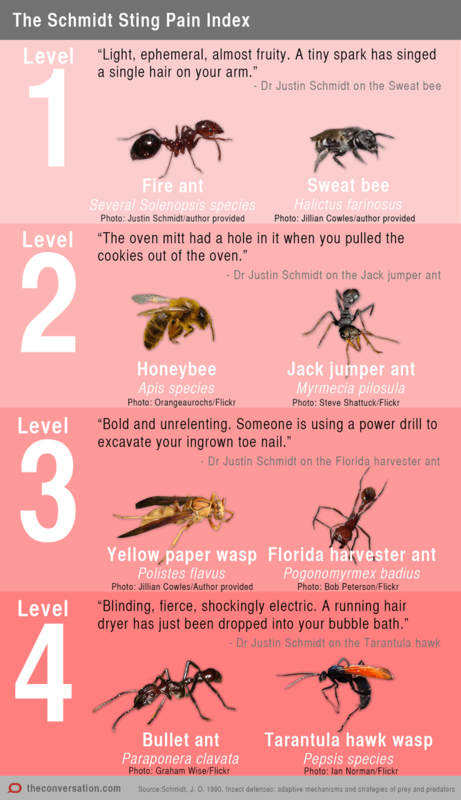 The insect sting pain index is more than just fun (which it is too). It provides a window into understanding ourselves, how we evolved to where we are, and what we might expect in the future. This article is the final part of our series Deadly Australia. You can see the whole series here. The link below is to an article reporting on a plan by Palau to ban commercial fishing and to create a massive marine sanctuary. The link below is to an article reporting on a proposal to create a national park on the moon – yeah, the moon. The link below is to an article that reports on work being done to create a massive marine sanctuary in Antarctica.